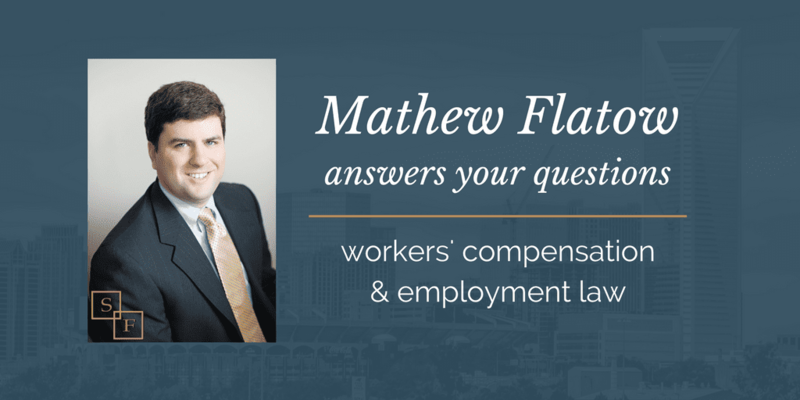 Mathew Flatow, founding partner at SeiferFlatow in Charlotte, NC, is an experienced employment law and workers’ compensation attorney who has helped many in North Carolina residents with their employment and workers’ compensation cases. In addition to his hard work in and out of the courtroom, Mathew often takes the time to answer questions on Avvo, an online legal services marketplace that provides lawyer referrals and access to a database of legal information consisting primarily of previously answered questions. Can an ex-employer continue your IRA and cash it in getting the money claiming you as an employee when you’re not? Is this fraud? Any IRA plan provided by your employer is governed by the plan documents that should have been disbursed upon your inclusion in the plan. Many plans have an administrative forum available where you can see if the plan has been run properly. Before any lawyer could give you advice on whether your employer has acted appropriately, they would need to review the documents. My recommendation is to get a copy of your plan and retain a local employment/benefits attorney to review the plan and give an opinion. These matters are very fact specific and it is hard to give general advice on an internet forum. In NC, if an employer violates any of the terms of an employment contract, does that mean the whole contract is void? This depends on the contract. I would retain a local attorney to review the contract and give an opinion on whether they are in breach and what remedies are available to you, if any. Can I be fired for fighting to move up within my company and asking for help and guidance on a regular basis with no action? North Carolina is an employment at-will state. Simply put, employment “at-will” means that an employer can terminate an employee without just cause and without any warning. Practically speaking, “at-will” employment makes it possible for employers to terminate employees for any non-discriminatory reason. Your case seems like a classic case of a non-discrimatory termination. I am not saying the employer acted appropriately or that their behavior is consistent with the standards I would want to see from North Carolina employers, but unfortunately it is not actionable. Unless you omitted facts of discrimination, I fear you probably do not have legal recourse. I was treated like a criminal for trying to find out if I had a valid EEOC complaint against my former employer. Where do I complain? The short answer is that you can file a complaint with the local EEOC about the employee’s conduct. I would recommend you do it in writing. As to the more important issue, make sure that your Charge of Discrimination was properly filed. You do not want to lose your statutory rights because of a bad experience with the intake personnel. If the Charge was properly filed, it will be investigated and your rights protected. My company announced a cost of living pay raise for everyone. Two months later I learned everyone received it except me. Is this singling out of an employee for wage discrimination legal? The company is free to make business judgments about who is entitled to a raise, whether it be merit based or cost of living. Unless you have good evidence that you did not receive the raise based on your race/religion/age/gender/etc., you likely have no recourse against the employer. Personal differences, as long as they are not based on one of the discriminatory groups, is an acceptable reason in North Carolina to not give a raise. If you are in need of legal counsel for a workers’ compensation or employment law issue, contact us today. Mathew and his team of experienced attorneys will help you get the best possible outcome for your case.